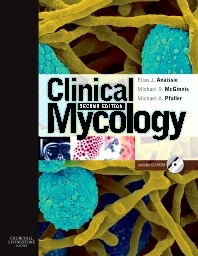 The first book of its kind to focus on the diagnosis, prevention, and treatment of patients with fungal infections, this definitive reference returns in a completely revised, full-color new edition. It presents specific recommendations for understanding, controlling, and preventing fungal infections based upon underlying principles of epidemiology and infection control policy, pathogenesis, immunology, histopathology, and laboratory diagnosis and antifungal therapy. More than 560 photographs, illustrations, and tables depict conditions as they appear in real life and equip you to identify clinical manifestations with accuracy. Expanded therapy content helps you implement the most appropriate treatment quickly, and a bonus CD-ROM—featuring all of the images from the text—enables you to enhance your electronic presentations. Includes specific recommendations for diagnosing, preventing, and treating fungal infections in various patient populations based upon underlying principles of epidemiology and infection control policy, pathogenesis, immunology, histopathology, and laboratory diagnosis and antifungal therapy. Covers etiologic agents of disease, fungal infections in special hosts such as pediatric patients and patients with cancer and HIV, infections of specific organ systems, and more, to make you aware of the special considerations involved in certain cases. Features clinically useful and reader-friendly practical tools—including algorithms, slides, graphs, pictorials, photographs, and radiographs—that better illustrate and communicate essential points, promote efficient use in a variety of clinical and academic settings, and facilitate slide making for lectures and presentations. Offers a CD-ROM containing all of the book’s images for use in your electronic presentations.